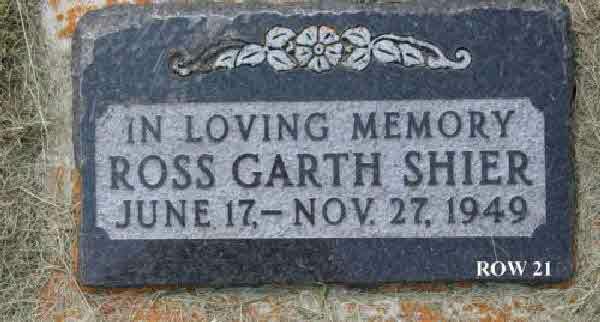 Burial* He was buried in Fairview Cemetery, Gates, Oregon, United States. 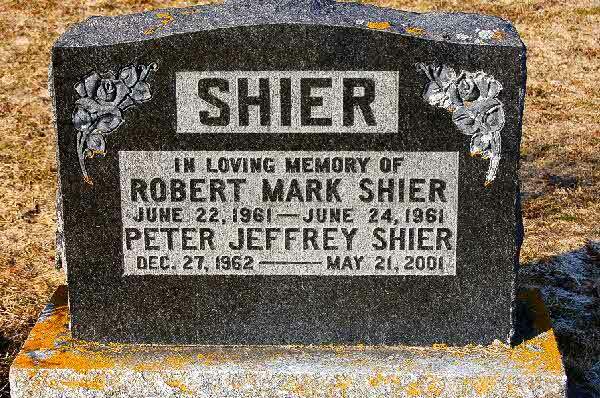 Death* Robert Francis Shier Jr. died on 18 March 2004 in Charleston, South Carolina, United States, at age 53; SHIER, JR., Robert Entered into eternal rest on the morning of March 18, 2004, Robert Francis Shier, Jr. Residence Charleston, SC. relatives and friends are invited to attend his funeral services Monday, March 22, 2004 at ten-thirty o clock. Interment, Carolina Memorial Gardens. may call at J. HENRY STUHR, INC, DOWNTOWN CHAPEL Sunday between five and seven o clock. 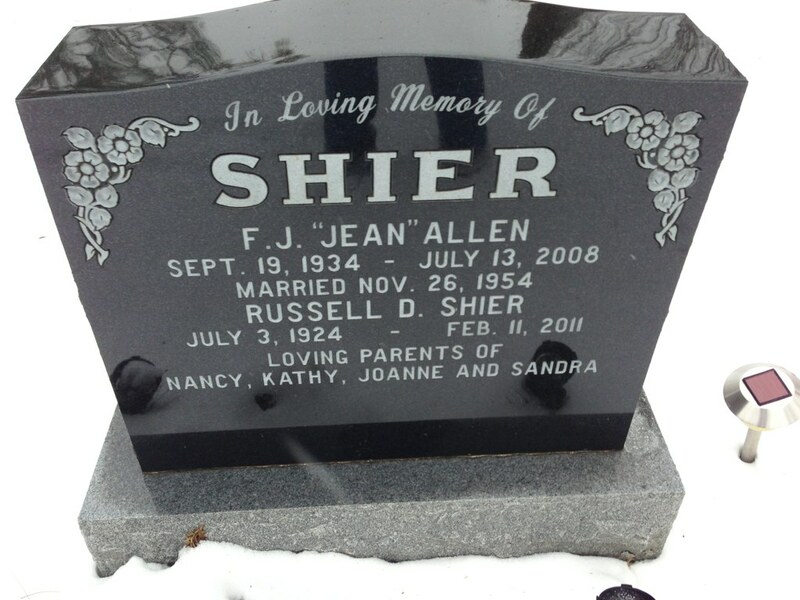 Mr. Shier was born December 1, 1950 in Charleston, SC, the son of Robert Francis Shier and Annie Steenken Shier. He was a graduate of St. Andrews High School and attended Trident Technical School. retired as Sergeant from the Charleston City Police Department. 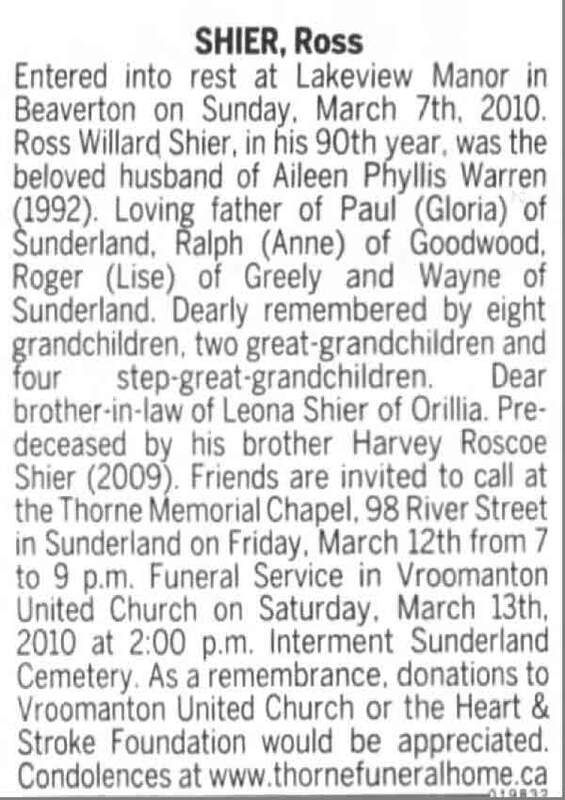 Mr. Shier was a member of St. Matthew s Lutheran Church, Charleston Elks Lodge, V.F.W. Post 445 of James Island. He served with U.S. Army. 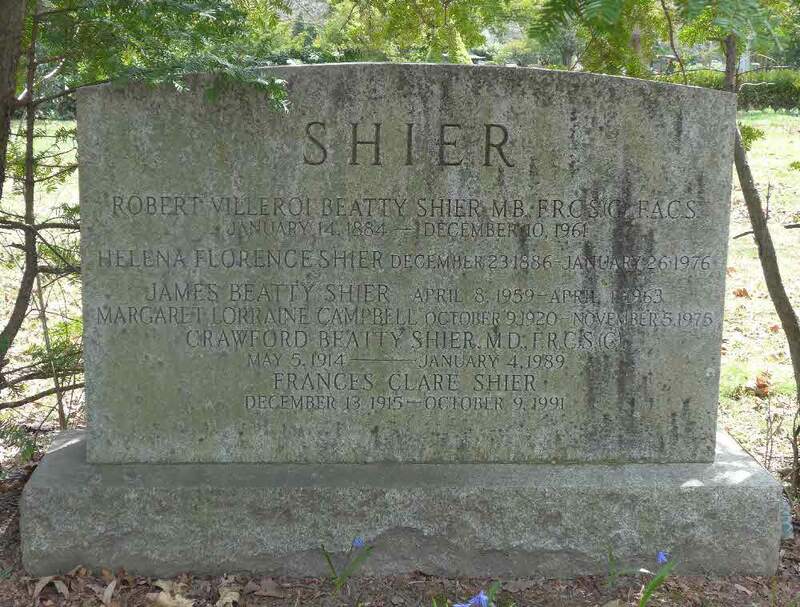 is survived by his Mother of Charleston, SC; two daughters: Sophie M. Shier and Amanda K. Shier both of Cheraw, SC; one son: Robert F. Shier, III of Cheraw, SC; two brothers: Herbert J Shier, Ronnie A. Shier and his wife Holly both of Charleston, SC. Memorials may be made to the charity of one s choice. Burial* He was buried in Carolina Memorial Gardens, North Charleston, Charleston County, South Carolina, United States. 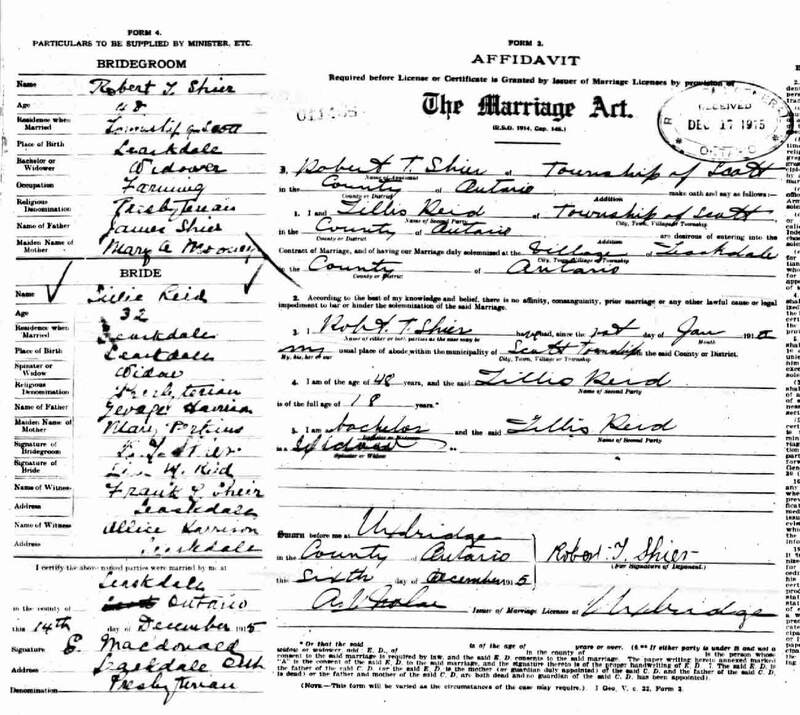 Marriage* Robert GEORGE Shier married Agnes Matilda Doble on 15 February 1888 in Scott Twp., Ontario County, Ontario, Canada. Death* He died on 13 November 1950 in Vancouver, British Columbia, Canada, at age 83. Burial* He was buried in St, John Cemetery, Brock Twp, Ontario County, Ontario, Canada. Marriage* Robert Greenway Shier married Mina Parker in July 1942. Burial* He was buried in IOOF ( Odd Fellows Cemetery), Grants Pass, Josephine County, Oregon, United States. 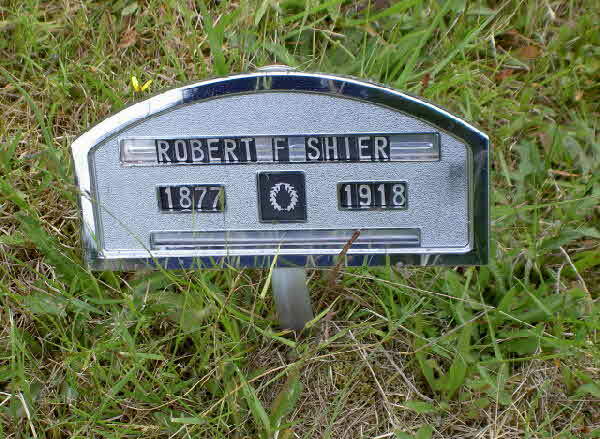 Burial* Robert John Samuel Shier was buried in Vandeleur Pioneer Cemetery, Artemesia Twp., Grey County, Ontario, Canada. 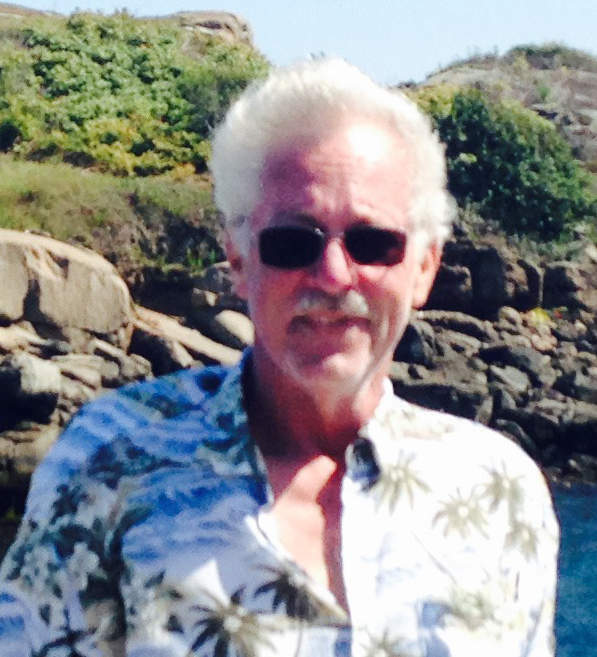 Death* Robert Johnston Shier died on 12 October 2017 at age 64; Robert Johnston Shier, 64, passed away unexpectedly on Oct. 12, 2017. He was born Feb. 17, 1953, in Seattle and has been a resident in Edmonds for 24 years. Robert is survived by his wife of 28 years, Christine, daughters Sara and Angela, sisters Margo (Ron) Otto, Janet (Jim) Morford, brother Allan (Jan) Shier and nephews and nieces. Bob served in the Army from 1972 to 1979, stationed in Heidelberg, Germany, where his love of travel developed while visiting 28 countries. After leaving the Army, Bob finished his degree in construction management. He has been an active member in the local 131 Carpenters Union since 1991, most recently working with Goebel Fixtures for the past seven years, traveling to many cities and supervising the installation of fixtures in high-end stores. Bob enjoyed spending time with his wife and daughters, getting projects done around the house, traveling, taking pictures and spending time outdoors. Bob has been our solid rock, a wonderful father and loving husband. 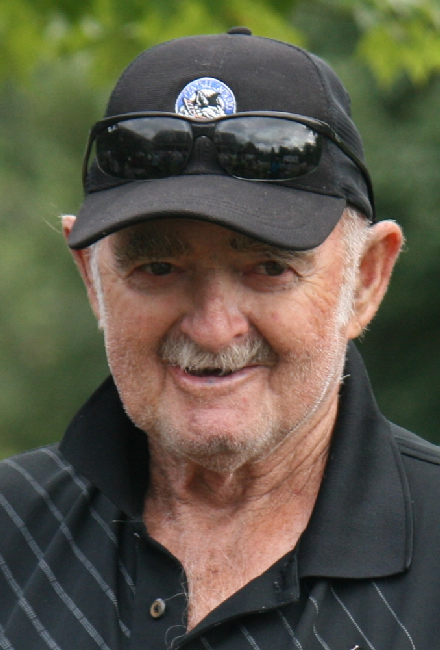 It's with great sorrow and shock; we will miss him and his humor forevermore. 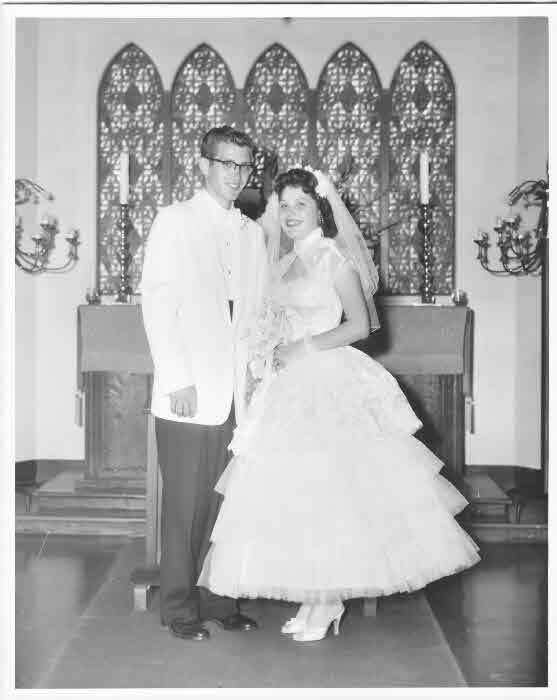 [S118] California, Marriage Index, 1949 - 1959, online \, Marriage of Robert O. Shier and Jakeita A. Mellies. 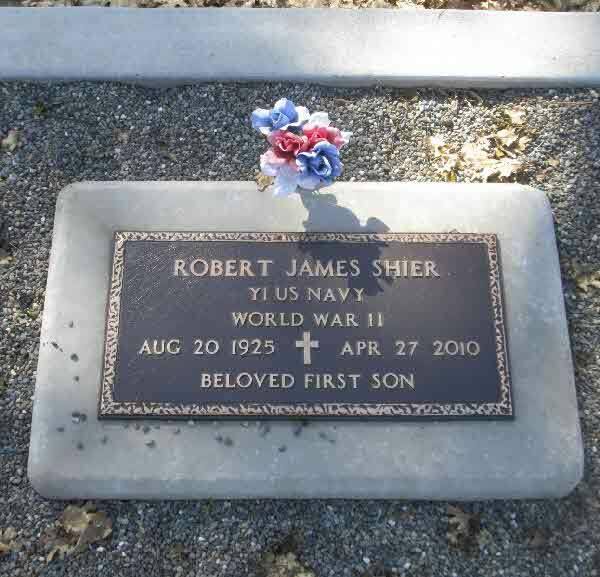 [S117] Nevada Death Index, 1980 - 2012, online \, Death Index for Robert O Shier, July 11, 1992. Burial* He was buried in Necropolis Cemetery, Brock Twp., Cannington, Ontario County, Ontario, Canada. 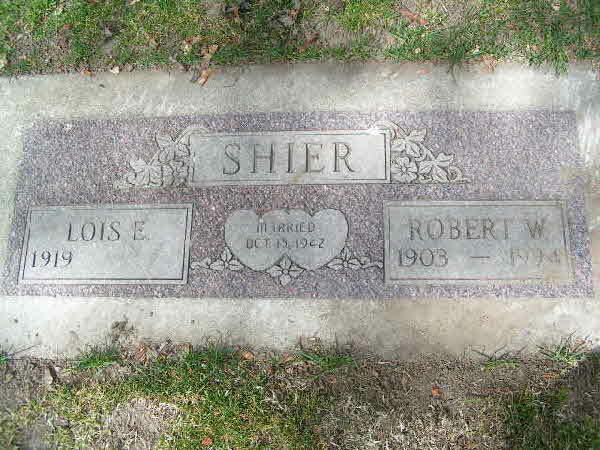 (Witness) Marriage Robert Timothy Shier witnessed the marriage of Beatrice Alberta Shier and Walter Lawson Barton on 8 September 1897 in Scott Twp., Ontario County, Ontario, Canada. 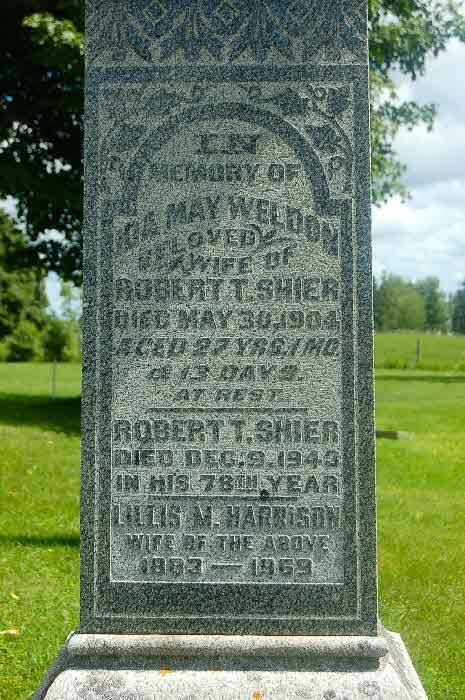 Marriage* Robert Timothy Shier married Ida May Weldon, daughter of John Weldon and Annie Holliday, on 1 March 1899 in Scott Twp., Ontario County, Ontario, Canada. 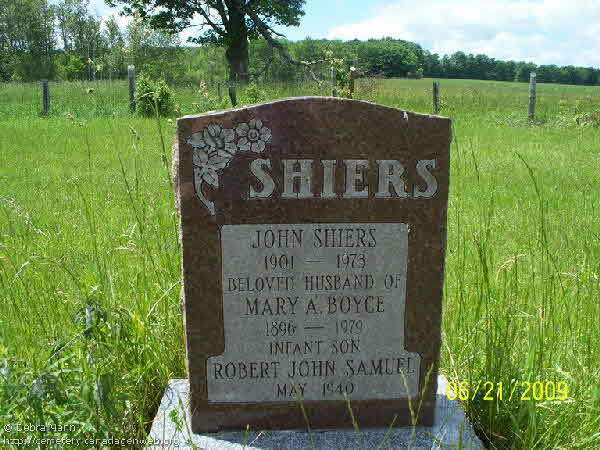 (Witness) Fact 1 Robert Timothy Shier witnessed the Fact 1 of James Shier; James Shier and Mary Ann Mooney Family. 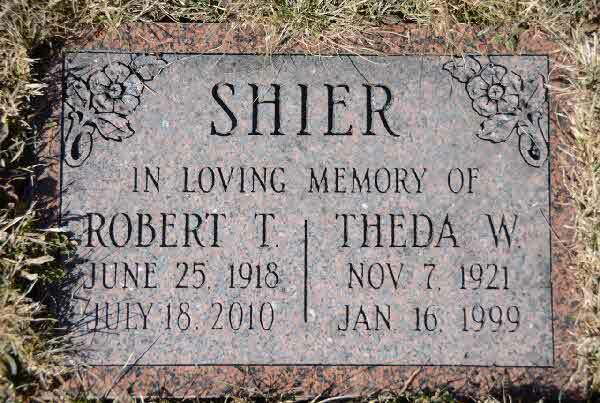 Marriage* Robert Timothy Shier married Sarah Elizabeth Maud Webster on 16 February 1909 in Reach Twp., Ontario County, Ontario, Canada. 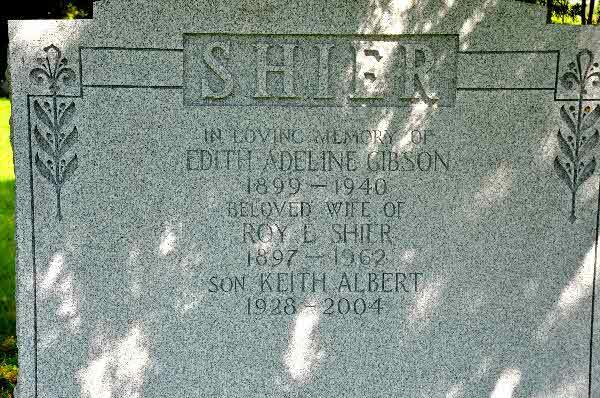 Marriage* Robert Timothy Shier married Lillis May Harrison, daughter of George Harrison and May Harrison, on 14 December 1915 in Leaskdale, Ontario County, Ontario, Canada. (Witness) Fact 1 He witnessed the Fact 1 of Morley Roy Shier; On October 3, 1911, Montgomery as Mrs. Ewan MacDonald was introduced as the minister’s new wife and honoured with a reception dinner at St. Paul’s Presbyterian Church. Three of the families she met that evening – The Shiers, the Brookses and the Lapps – would never have expected to be mentioned in her books. Catherine* and James Shier’s farm was located a few acres away from the Leaskdale Church. They had three children in 1911: Mabel was nineteen; Morley, sixteen, was a student at Uxbridge High School; and Harvey was nine. Death* He died on 9 December 1943 in Scott Twp., Zephyr, Ontario County, Ontario, Canada, at age 78. Burial* He was buried in Foster Memorial Cemetery, Ontario County, Ontario, Canada. 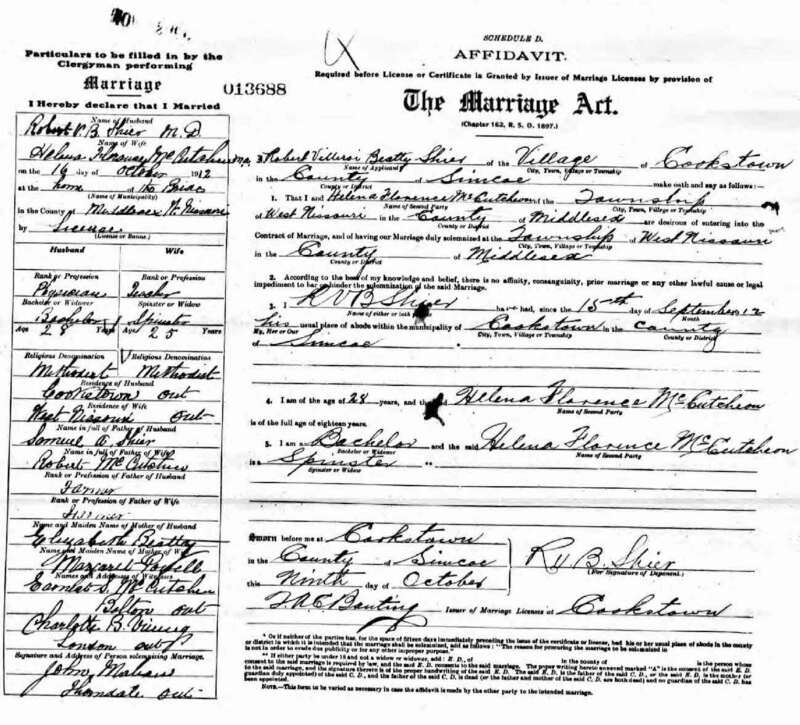 Marriage* Dr. Robert Villeroi Beatty (Roy) Shier married Dr. Helena Florance McCutcheon, daughter of Robert McCutcheon, on 16 October 1912; In the home of the bride, West Nissouri TWp, Middlesex County, Ontario. 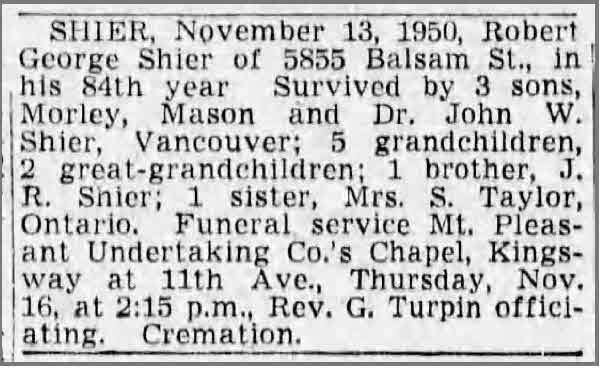 Death* He died on 28 December 1994 at age 91; Robert William "Bob" Shier, 91, a longtime resident of Wenatchee, died Wednesday, Dec. 28, 1994.
was born Nov. 11, 1903, to Joshua R. and Laura (Schulenburg) Shier, at Mylo, N.D. 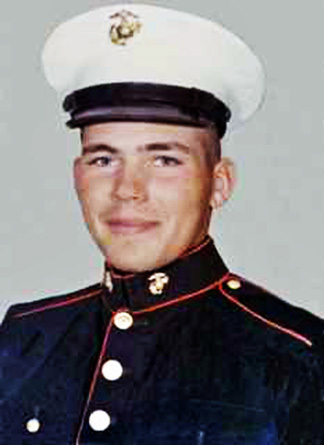 The family later moved to Bisbee, N.D., where he grew up and finished high school. 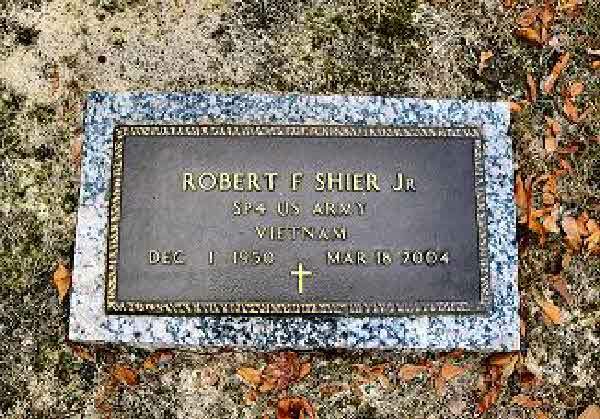 Mr. Shier served in the U.S. Army for nine years. Several years after his discharge he was drafted back into the Army in March 1942 and served during World War II. He attended officer candidate school and was transferred to the U.S. Air Force where he was a personnel officer. 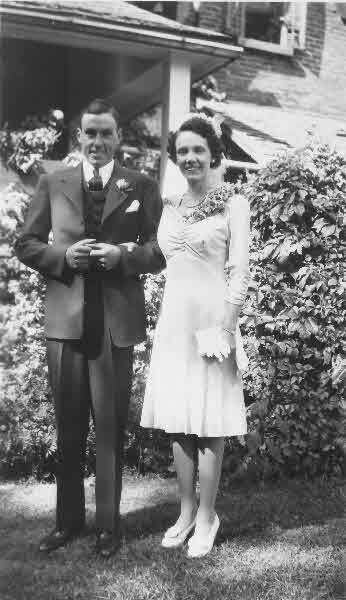 He was discharged in 1946.
married Lois Steele on Oct. 15, 1942, at Cando, N.D. After World War II they lived at Rocklake, N.D., for 10 years. They moved to Wenatchee in 1956. Mr. Shier worked at service stations; at the time of his retirement in 1970 he owned Triangle Texaco with Del Hurt. was a member of the First United Methodist Church. He had won a number of trophies bowling and had been a member of the Ginkgo Mineral Society. 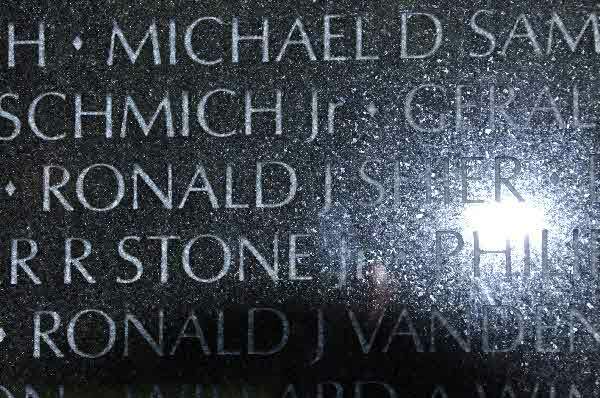 is survived by his wife, of Wenatchee; two brothers-in-law, Lamar Steele of Wenatchee, and Melvin Price of Rocklake, N.D; and a sister-in-law, Mildred Shier of Moses Lake. He was preceded in death by four brothers and four sisters. are by Jones and Jones Funeral Directors, Wenatchee. Evergreen Memorial Park WenatcheeCounty, USA. Burial* He was buried in Evergreen Memorial Park, East Wenstchee, Douglas County, Washington, United States. 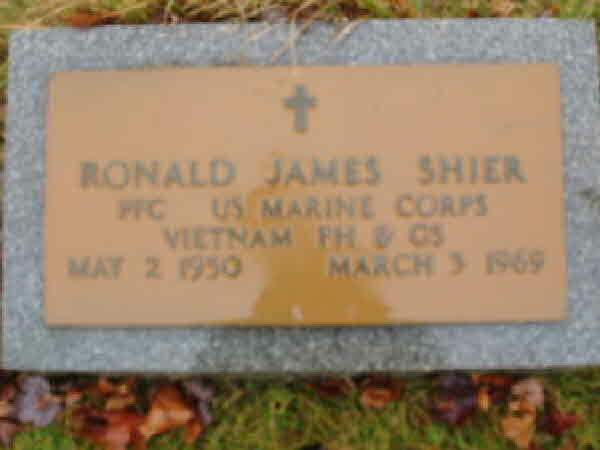 Burial* He was buried in Maple Hill Cemetery, Cadillac, Wexford County, Michigan, United States; and his name is inscribed in the Vietnam Memorial in Washington, D.C.
Death* Ronald L. Shier died on 30 August 2013 at age 74; Ronald L. Shier, age 74, of 6124 State Street, Garden, Michigan, passed away Friday, August 30, 2013, at the Schoolcraft Memorial Hospital. 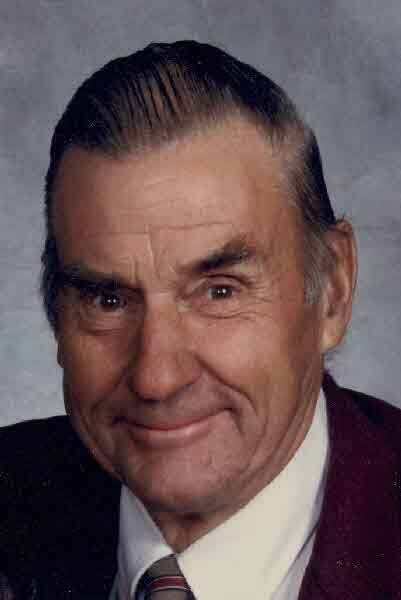 Death* Ronald Ray Shier died on 3 November 2018 in Brock Twp., Ontario County, Ontario, Canada, at age 80; Suddenly at the farm, Ron Shier, beloved husband of Jeanne (nee Alsop) and father of Cathie (Brian Snoddon), Pam (John Owen), George Daniel (deceased), Julie (Rick Linton) and Raymond Shier (Lori). Proud Poppa of Courtney, Danny, Brooke, Terry, Josie, John Jr, Raven, Owen and Ryan. Survived by his sisters Carole Bickle, Gail (Alex) Williamson, and Linda Wagg (Elwood Kirten). Dear brother-in-law to Ken and Helen Alsop. He will be missed by many nieces and nephews. 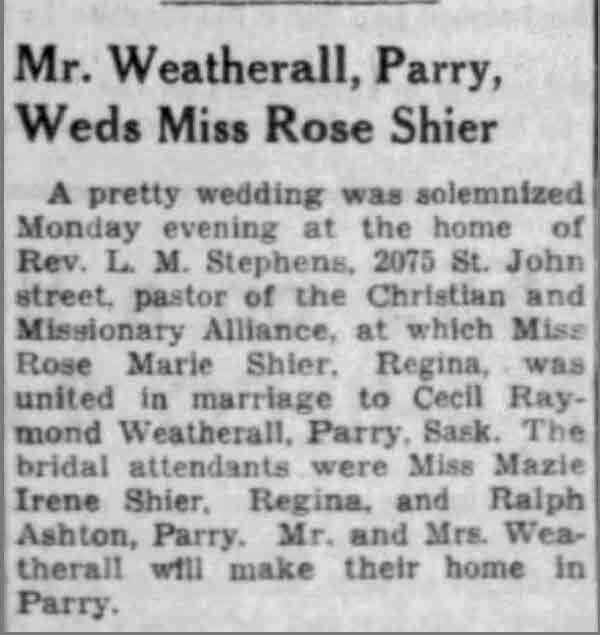 Marriage* Rose Marie Shier married Cecil Raymond Weatherall on 23 August 1937. 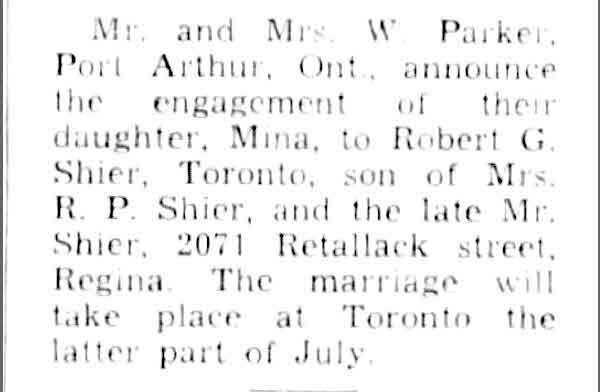 Marriage* Ross Willard Shier married Aileen Phyllis Warren, daughter of Frederic Borlase Warren and Katherine Campbell, on 26 August 1944 in Mara Twp., Brechin, Ontario County, Ontario, Canada. 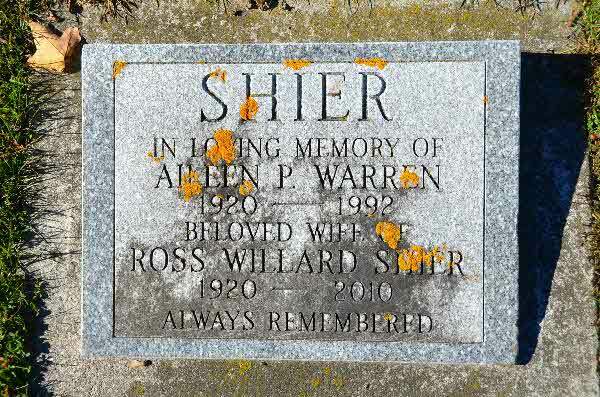 Death* Ross Willard Shier died on 7 March 2010 in Lakeview Manor, Beaverton, Ontario County, Ontario, Canada, at age 89. 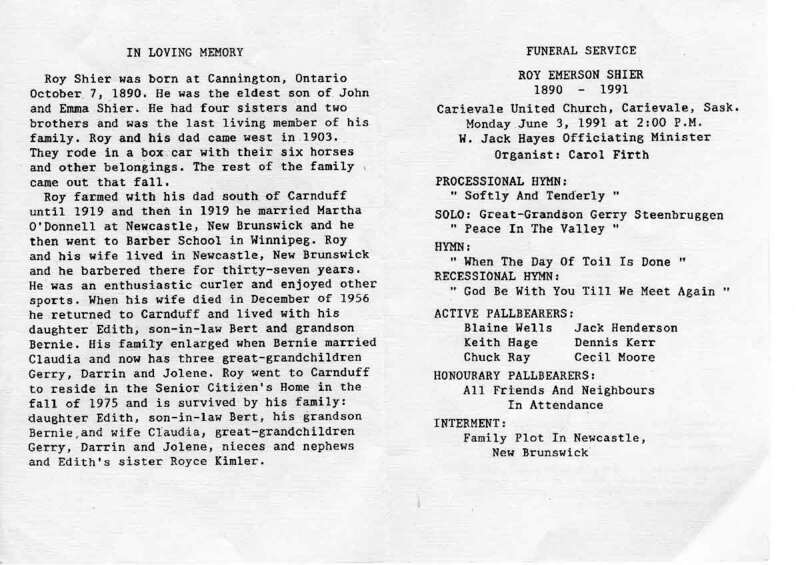 Burial* He was buried on 13 March 2010 in Sunderland Cemetery, Brock Twp., Ontario County, Ontario, Canada; Funeral held at Vroomanton United Church. 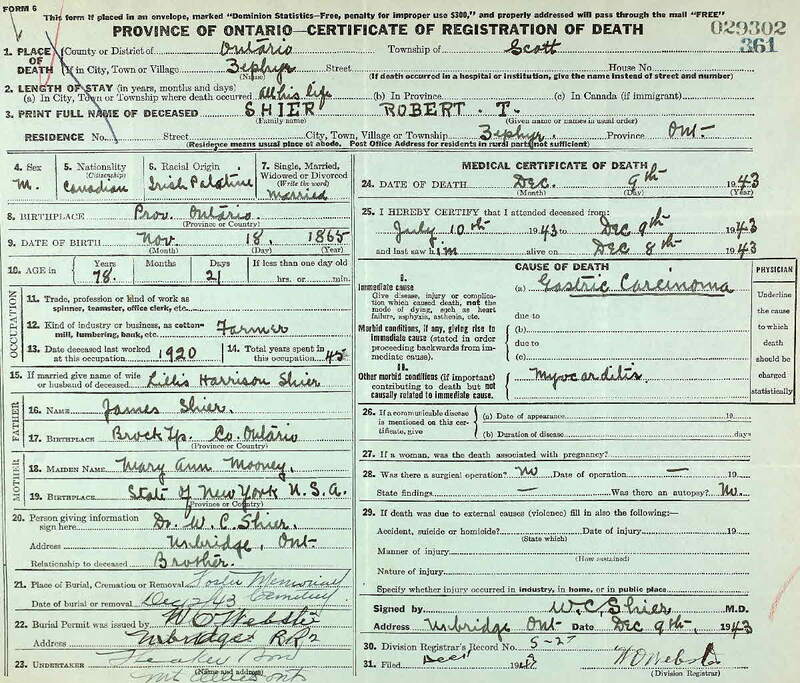 Burial* He was buried on 17 August 1934 in North Brock Shier Cemetery, Brock Twp, Ontario County, Ontario, Canada. 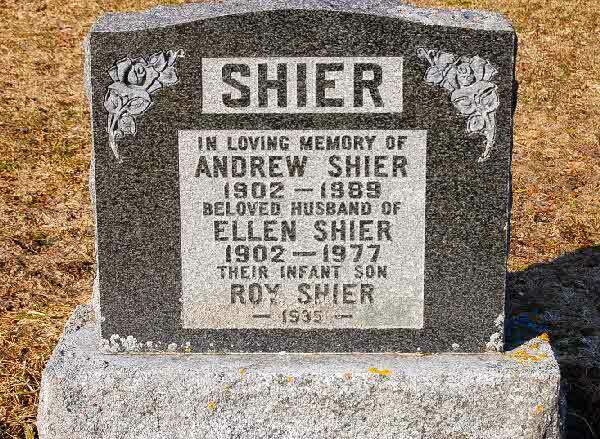 Birth* Roy Edwin Shier was born on 1 March 1905 in Kincardine Twp., Bruce County, Ontario, Canada. 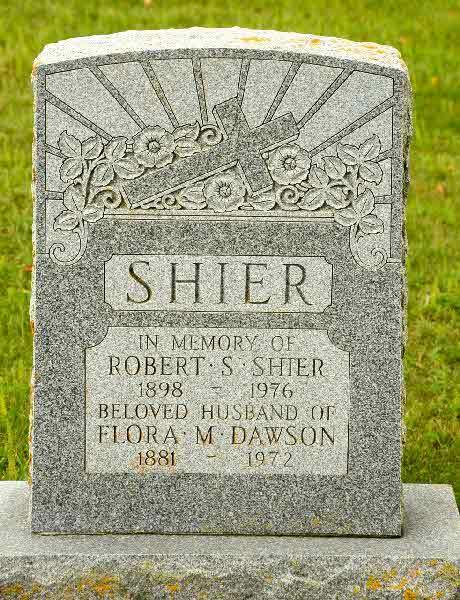 Death* Roy Edwin Shier died on 28 June 1915 in Kincardine Twp., Bruce County, Ontario, Canada, at age 10. 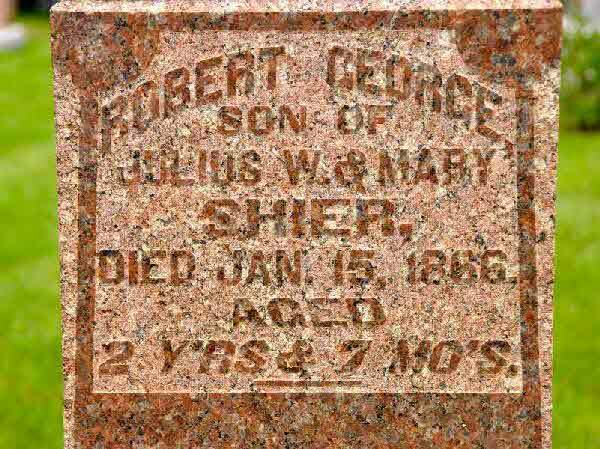 Burial* He was buried in Janesville Cemetery, Janesville, Lassen County, California, United States. 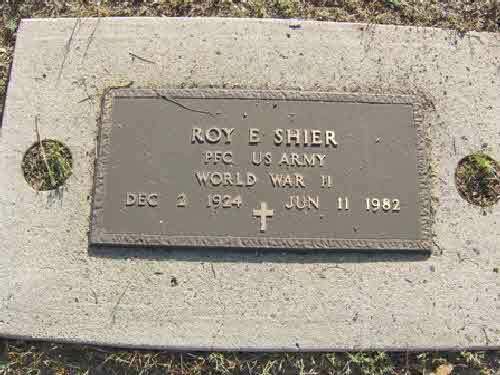 Death* He died on 30 May 1991 in Carnduff, Saskatchewan, Canada, at age 100; Roy Shier was born in Cannington, Ontario, October 7, 1890. 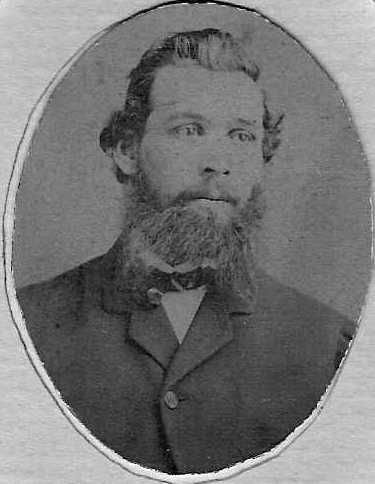 He was the eldest son of JOhn and Emma Shier. 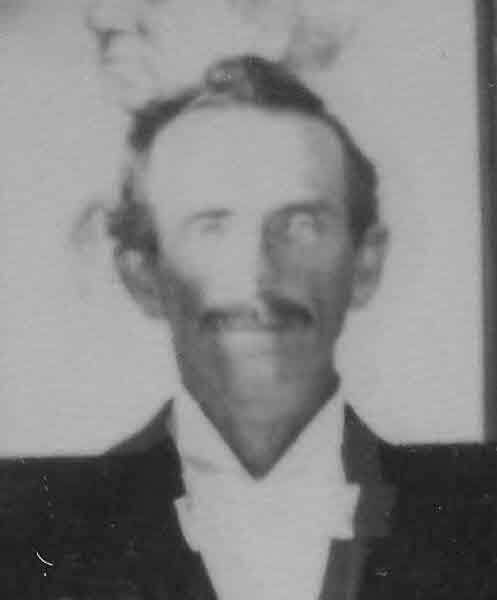 he ahd four sisters and two brothers and was the last living member of his family. Roy and his dad came west in 1903. They rode in a box car with their six horses and other belongings. The rest of the family came out that fall. 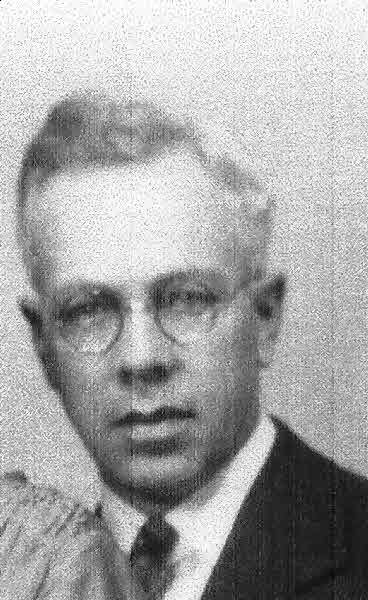 Roy farmed with his dad south of Carnduff until 1919 and then in 1919 he married Martha O'Donnell at Newcastle, New Brunswock and he then went to Barber School in Winnipeg. Roy and his wife lived in Newcastle, New Brunswick and he barbered there for thirty-seven years. He was an enthusiastic curler and enjoyed other sports. When his wife died in December of 1956 he returend to Barnduff and lived with his daughter Edith, and son-in-law Bert and grandson Bernie. His family enlarged when Bernie married Claudia and now has three great-grandchildren Gerry, Darrin adn JOlene. 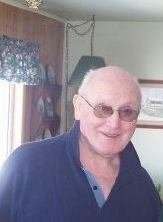 Roy went to Carnduff to reside in the Senior Citizens Home in the fall of 1975 and is survived by his family: daughter Edith, son-in-law Bert, his grandson Bernie and wife Claudia, great grandchildren Gerry, Darrin and Jolene, nieces and nephews adn Edith's sister Royce Kimler. Credit Donna and Lowell Ludford. 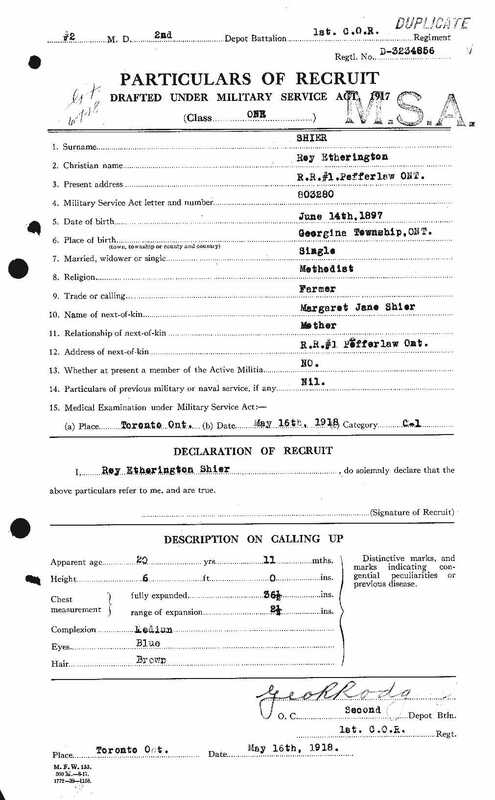 Milit-Beg* Roy Etherington Shier began military service on 16 May 1918 in Toronto, York County, Ontario, Canada, drafted under the Military Serivce Act. Burial* He was buried in Bagshaw Cemetery, Brock Twp., Ontario County, Ontario, Canada. 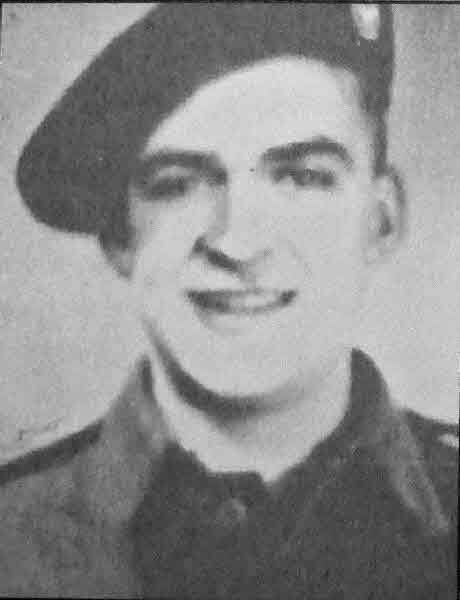 Fact 1* He was discharged from the military after having spent 10 months in a POW Camp, Stalag VII C.
(Witness) Marriage Roy James Shier witnessed the marriage of Arthur Wilson Rinn and Gladys Edith Shier on 19 April 1947. 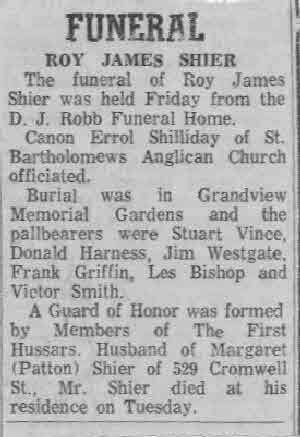 Death* Roy James Shier died on 5 June 1973 at age 51. Burial* He was buried in Resurrection & Crematorium/Grandview Memorial, Sarnia, Lambton County, Ontario, Canada. 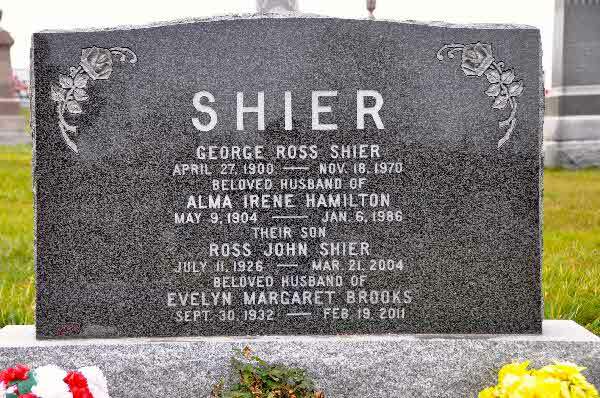 Death* Russell ALLEN Shier died on 20 September 1974 at age 61; Suddenly in hospital Friday, Sept 20, 1974. 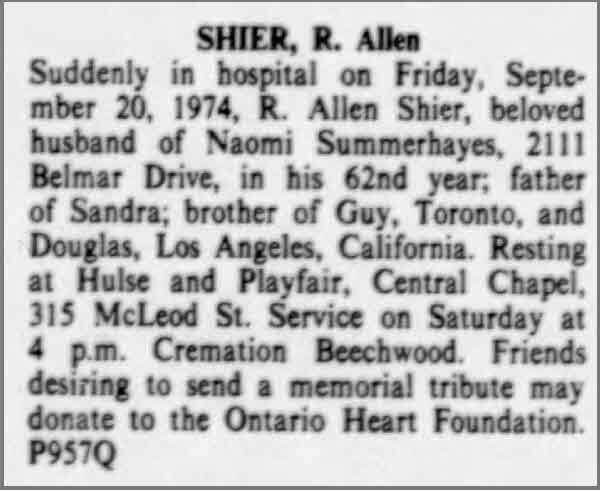 R. Allen Shier, beloved husband of Naomi Summerhayes, 2111 Delmar Dr. in his 62nd year, father of Sandra, brother of Guy, Toronto; and Douglas, Los Angeles, California. Resting Hulse and Playfair, Central Chapel, 315 McLeod St. Service on Saturday at 4 P.M. Cremation Beechwood. Friends desiring to send memorial tribute may donate to the Ontario Heart Foundation. Ottawa Journal Sept 21, 1974.